Paul McCartney: Beatle. Icon. Ballet composer. 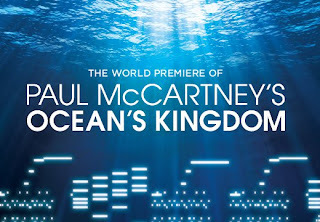 On September 22, 2011, Sir Paul McCartney made his ballet debut with Ocean’s Kingdom, for which he is credited with writing the music and libretto. According to program notes, the collaboration between Sir Paul and New York City Ballet Master in Chief Peter Martins (who choreographed Ocean’s Kingdom) began at the School of America Ballet’s Winter Gala. 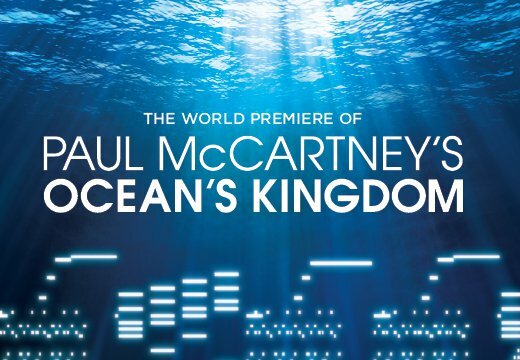 “Being aware of McCartney’s interest in classical music,” the notes say, “Martins broached the idea of them one day collaborating on something.” And so McCartney and Martins began work on what would become Ocean’s Kingdom. At the party, Stone and Honorata continue their courtship, much to the displeasure of King Terra. He enlists the traitorous Scala (Georgina Pazcoguin), Honorata’s chief of staff, if you will, to help steal away Honorata from Stone. King Terra and Scala bid successful, and King Terra whisks away Honorata, tearing her from her lover, who is left heartbroken. Next we see Honorata in captivity (perfectly suggested by Mark Stanley’s brilliant lighting design), devastated by her separation from Prince Stone. Stone appears but cannot break her out of prison. Suddenly Scala arrives and the two lovers plead with Scala to help Honorata escape. Seeing their pure love for one another, Scala realizes her mistake and helps Honorata out of captivity and aids Honorata and Stone as they escape to freedom. This is a good ballet, and one which, because of Sir Paul’s name recognition, will certainly be folded into the City Ballet repertoire for years to come. However, it’s not a great ballet, and it seems a rather insignificant work in the annals of ballet history. McCartney’s score is good if elementary. I don’t claim to know music theory or know much about composition, but I knew very well what my ears hear. I liked that, fittingly, the ocean themes were more legato and the terra themes tended toward the staccato. I was underwhelmed, however, with the expected changes in tone when different characters appeared: the score grew heavier and darker when evil lurked and brightened up when good triumphed. (It may delight some Beatles fans that here and there I heard remnants of familiar Beatles tunes, particularly “Sgt. Pepper.”) McCartney is admittedly just beginning to dabble in classical music and this is his first foray into composing for ballet. Grading on a beginner’s curve, I’d give this not too complex composition a C – just average. Prince Stone and others from the earthly kingdom were in black body suits that had flesh-toned cutouts and designs (the patterns varied from dancer to dancer) that effectively evoked terra cotta pottery and other earthenware. The one miss, though, were the costumes in movement two. (This part of the story was a miss, too, bloating the ballet with an unnecessary divertissement, and no plot development that couldn’t have happened quicker or in the previous movement.) Here, there was a garish mix of comically colorful clown-like costumes. It was like Joseph and his amazing Technicolor dream entertainers had come to dance for us. Led by Daniel Ulbricht as the Lead Entertainer, an Exotic Couple, some Amazon Women and Drunken Lords came out to “entertain” us. The problem was there costumes were disorientingly different from the look of the rest of the ballet (and it so stalled the plot) that the brief entertainment felt like an eternity. It also didn’t help matters that the Exotic Couple was clad in yellow body suits with cutouts that made it look like they accidentally wandered in from The Lion King. But this is the ballet, dear readers, so let’s get to the dancing. Martins choreographed a lovely ballet that served the story well, and I liked that though this is a narrative ballet, the miming was kept to a minimum and Martins relied mostly on dance to tell the story. Lovely as the choreography was, there was nothing terribly impressive or unforgettable about it. (Martins’s Romeo and Juliet – especially the balcony scene pas de deux – on the other hand, is exquisite.) But though the choreography was forgettable, its execution was not. Mearns and Fairchild had great chemistry. (This is the first time Martins has choreographed for them as a pair.) You may remember that I tend to like watching Fairchild dance with Sterling Hyltin, but I think Mearns did a terrific job here, and her grounded nature made her a good choice to dance Honorata. And, of course, I thrilled over watching my dear Robbie Fairchild, whose presence is commanding and whose passion for dance and the role he’s dancing always shines through. In contrast to the soft flow of the ocean dwellers’ dancing, all the terra dancing, led expertly by Amar Ramasar, was crisp and precise (and actually reminded me a lot of the precision in Christopher Wheeldon’s Mercurial Manoeuvres.) 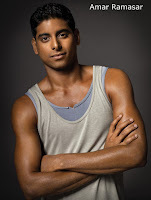 Ramasar was an intense villain, and he impressed with his powerful and steady moves. As presented on Tuesday night (five nights after its premiere), Ocean’s Kingdom looked like a preview performance of a new musical. There was some tentative dancing, with some dancers looking like this dance wasn’t in their bones yet. And it may not be. It’s a new work. I think with a little more shaping, trimming and tweaking, it could be better. Perhaps this is a preview period, and the next time Ocean’s Kingdom is performed (which, I believe, will be this spring) it will have grown into its pedigree. Curiously paired with Ocean’s Kingdom was Balanchine’s Union Jack. With music by Hershey Kay, who adapted the score from traditional British music, this ballet, according to repertory notes, “was created to honor the British heritage of the United State on the occasion of its Bicentennial.” It gets there, but only after a laborious start. We start by being introduced to the many regiments: First is the Scottish and Canadian Guards regiments, led by Joaquin de Luz and Charles Askegard; next is Green Montgomerie, led by Abi Staffard, Jared Angle and Janie Taylor; Wendy Whelan leads MacDonald of Sleat; and Maria Kowroski is at the head of the Royal Canadian Air Force. For the first five or seven minutes, it’s nothing but each regiment – slowly and methodically – marching out to a drum roll. I tired quickly. After all the regiments had made their entrance, the individual regiments got a chance to dance and things started to pick up. Throughout the whole thing, though (and later on, too) I wished the dancers had been wearing tap shoes, as their hoofing would have complemented the percussive score and added some interest to a rather dragging first part. Veyette was charming in the “Anything you can do I can do better” battle, but I was really impressed with Fairchild. She had a sweet – but not treacle – demeanor, and she’s of the beautiful comedienne, Reese Witherspoon-ish ilk. Cute but not cutesy, fun, funny and carefree, Fairchild had the audience – and Veyette – wrapped around her little finger by the time the divertissement was through. The finale continued the whimsical vibe of part two, with the Royal Navy and the Women’s Royal Naval Service coming out to show their patriotism. In various groupings, the naval academy engages in a dance marathon of patriotism, as once they come out on stage, they never stop moving. It was truly impressive. (Again, I wished they were wearing tap shoes, and because of the naval uniforms, I kept thinking about the incredible nine-minute tap dance in Anything Goes.) The fun ends with the company using hand flags to spell out – in Marine semaphore code – “God Save the Queen.” It’s a playful end to a ballet that starts out drudgingly slow but builds to a boisterous finale. For more information or to purchase tickets, visit nycballet.com.